I am honored to host the Lasang Pinoy Food Blogging Event for the month of October, and the theme is Pinoy Street Food! Street food is a phenomenon around the world. It may have started in ancient times when there were no permanent market centers, and vendors had to be ambulant. But with the advent of central and semi-permanent markets, streetfood has evolved into something of a distinct category, becoming a culture in itself. So much so that the streetfood of a particular place actually defines its character, and shows the cultural and geographical roots of its inhabitants. Streetfood may also be a testament to humankind's nomadic roots - we are by nature travelers, and food in the streets provides a cheap form of quick nourishment wherever we are. But sometimes, a flourishing streetfood trade is an unmistakable sign of a locality's economic decrepitude - a red flag that people are subsisting more on less nutritious fare because it is the only food they could afford. In the Philippines, however, streetfood has become a lifestyle, and does not function as a sign of the times, as observed by the late Pinoy food guru Doreen Fernandez. For Pinoys, food on the streets, most often than not, has gone up to the level of something comforting. Because Filipinos grow up with, if not on, streetfood. Streetfood is a wide range of ready-to-eat foods and beverages sold and sometimes prepared in public places, notably streets, as defined by the Food and Agricultural Organization (FAO) of the United Nations, as agreed upon in the 1986 Regional Workshop on Street Foods in Asia. The Pinoy streetfood selection is so varied - benefiting from numerous regional influences - colorful, with some bordering on the exotic, or at least for non-Filipinos. It is encountered during recess time and after classes outside school gates, after mass in churchyards, in peripheral market alleys, at the corners of corporate buildings and offices. Also outside homes, where the enterprising home-dweller has found a way to augment the family income while staying at home full-time. These are the streetfood hawkers who are sitters - finding space enough to sit down, lay down their wares and wait for customers. But Filipinos are not known for being enterprising for nothing. This is best exemplified by food vendors who brave vehicles along the road, boarding passenger jeeps or buses, or snaking among vehicles stalled in traffic and knocking on car windows. So we always have something to munch on while waiting for commercial trips, upon boarding buses, during the ride itself, during stop-overs, and upon arriving in the final destination. Or while driving around city streets. But even if we stay at home, streetfood vendors come to us. Anytime during the day, and well into the night, we can hear the names of Pinoy merienda treats being called out in the streets. Or being rung off with shrill bells in the wee hours of the morning or during sweltering afternoons. All of which make the Filipino food landscape distinct, imbedded in the Pinoy culture and consciousness. So, if you were a Pinoy streetfood, what would you be? Ok, dear Pinoy food bloggers, blog about your favorite streetfood - it may be something you ate outside school when you were young, or maybe even streetfood forbidden you as a kid. It may be your favorite snack while on the road, driving around the metropolis or on the way to the provinces during holidays. Or maybe the streetfood you eat during merienda (morning or afternoon snacks), or on the way home from the daily grind. Or maybe, due to the relatively risky nature of streetfood in terms of health and safety, you cook your own version of a preferred streetfood. Or maybe you are a gourmand, and you have created something sophisticated from a lowly favorite streetfood. Share with us the recipe! Or maybe it's a streetfood you closely identify with as a Filipino. Or a streetfood that you think best represents lasang Pinoy. Do tell about it, including the origins of the streetfood, if you can. Or tales of your favorite hawker. For Pinoys or quasi-Pinoys who were born and who grew up abroad, you can blog about streetfood you eat when visiting the Philippines. Otherwise, share with us the streetfood in your area. To make this an event for the entire month of October, please post your entries anytime from October 10 to 24, then email to lasang.pinoy@gmail.com your name, address, the name of your blog, and the permalink to your entry. For non-bloggers, you can email your article and photo, if you have, with the same particulars. Please indicate in the subject field Lasang Pinoy 3 entry to facilitate identification. Please also include this tag <Lasang Pinoy 3> at the end of your post, then ping Technocrati for your entry to be automatically rounded-up. I will also do the round-up on this blog at the end of October, so please visit again so you could include the link on your post. Salamat, and looking forward to reading your posts! Lasang Pinoy (a taste of the Philipines, or Filipino taste) is a monthly food blogging event about Filipino food and culture and its promotion and development, conceived and launched by Karen and Stef in August of 2005. It is open to all Pinoys, non-Pinoys who have married Pinoys or who consider themselves Pinoys by taste, whether bloggers or not. Pinoy is the slang for Filipino, and anything about the Philippines. Thanks to Ilocana Chef for the Lasang Pinoy button, and also to JMom for the link. I've listed Pinoy food bloggers (courtesy of Stef) on the sidebar, and I'm hoping all of them will participate regularly. If yours is missing, or if you know any Pinoy food blog that should be included, please let me know and we will include it in the line-up. The Lasang Pinoy 3 button is courtesy of Mang Mike of La.fang. *Photo shows the permanent fixture of the Filiipino streetfood landscape, the sorbetero, or ice cream vendor, and his colorful cart. He has, and continues to work his way into the sweet memories of every Filipino child and child-at-heart. You can read about the round-up of entries here. 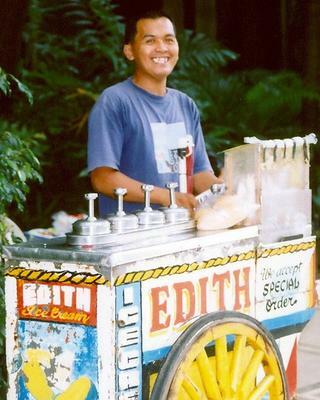 I was in Makati in 2002, but didn't eat any street food. Could you write about your food experiences in Makati then? We would love to read about it! kai! now i don't know which street food i'd like to post, there are so many. hello kai, excellent theme (and very timely :D)! i only know and have eaten a few so i'm looking forward to learning about a bunch more! hmmm...Pinoy street food, eh? do drinks count? like halo halo? Drinks are definitely in, Queenkv! Thanks for the early posts! One week more! Sorry medyo na-late ang entry ko sa LP3. Di ko pa rin kasi ma-upload ang pic sa isa kong blog, so inilipat ko na lang doon sa isa. It's www.leiorchid.blogspot.com. Okay pa rin ba iyon? Galapong malagkit is of course what they still use back there. Just reduce water in recipe and do’nt have to wait before steaming. A lot of supposed Bataan stuff I assume all along as common to Central Luzon until non-Bataan folks point them out to me as such. The exchange goes like this: Oh you’re from Bataan, ay di nagluluto ka ng...Like those Bilobilo which are actually tiny buchis in coconut milk sauce I first tasted as gradeschool recess treat. Fun to make (meaning labour-intensive) just like forming playdough with the palm of your hands. I tried using rolling pin (big mistake), stuck all over the place. Simplified it by using a much thinner sort of tikoy first to use for wrapping the filling. They originally filled them with a simple mungo paste, skin and all but here I gentryfied it and polished off the rough edges by using skinless yellow mung, real ube or gabi or red azukis. They are baked like bibingka but here I present them also as bilobilo in guinataan and serve one of each colour since they are a bit larger. Impressive but IMHO sanitized and not quite as satisfying as the original off the street. Hello Everybody, I am new in here, Ms. Celia had invited me. Here we go again, speaking of street foods. I am considering if street foods are SAFE to eat? I happen to eat one of those mobile "food stalls" but I can’t eat the food the taste is just different (I don’t know why). Well, that was my first and last instance to try street food (mobile food stalls). I urge those businessmen to make sure all the foods they serve are properly prepared.